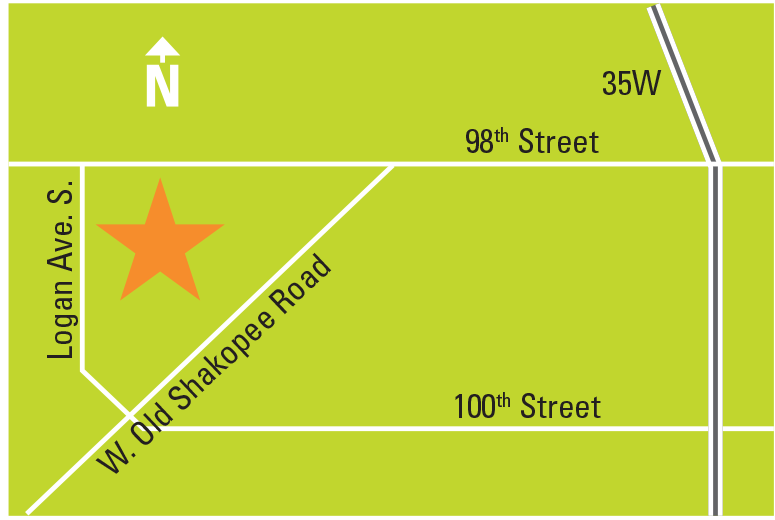 Artistry is the largest tenant at the Bloomington Center for the Arts at 1800 W. Old Shakopee Rd., Bloomington, MN 55431. The BCA houses seven independent, nonprofit arts organizations. It is owned and operated by the City of Bloomington and contains two theaters, two art galleries, arts classrooms, a dance studio, and offices for the resident arts organizations. To learn more about the BCA, click here. Parking is available on the west side of the building at 98th St and Logan Ave. Additional parking is located in the northeast lot at 98th St and James Ave.
By car: From I-35W, exit at 98th St and head west on 98th St for approximately one half mile to Logan Ave S. Turn left onto Logan Ave S and then left into the first parking lot entrance. Enter through the doors on the north end of the building closest to 98th St.
By bus: Metro Transit lines 535 and 539 run along 98th St, and line 597 runs along W Old Shakopee Rd. For more detailed transit information, visit the Metro Transit website. By bike: Bike racks are located in all parking lots at Bloomington Civic Plaza. Metro Mobility: Drop-off is in the northwest parking lot at 98th St and Logan Ave. Parking: Accessible parking is available in all Bloomington Center for the Arts lots. The closest and most convenient accessible parking is in the lot on the west side of the building. Public Wheelchairs: The Bloomington Center for the Arts has wheelchairs and one power scooter available for public use free of charge. Please inquire at the City Information Desk when you arrive. Elevators: The Atrium Gallery and second-floor arts classrooms are accessible using the elevator just behind the City Information Desk in the Center for the Arts lobby. Theater Seating: Both theaters in the Bloomington Center for the Arts have accessible wheelchair/scooter seating. The Schneider Theater also has a limited number of transfer seats available. Please let us know when you purchase your tickets online or by phone that you require accessible seating. If you have questions or need further assistance, please call our box office at 952-563-8575. Restrooms: All restrooms in the Bloomington Center for the Arts are fully accessible to patrons in wheelchairs. A private restroom is available on the main floor for patrons who require assistance. We offer assistive listening devices for all of our Schneider Theater perfomances free of charge. Devices may be obtained at the Will Call desk. Please be prepared to leave a driver's license or other valid ID as security. American Sign Language (ASL) Interpretation: We offer one signed performance for every Artistry production as indicated by the symbol on our performance calendars. Please request the interpreter section when placing your ticket order. We are grateful to the Bloomington Lions Club for supporting ASL interpretation for our productions in the Black Box Theater. Audio Description (AD) services: We offer AD services at one performance of each Artistry production as indicated by the symbol on our performance calendars. Please request this service when placing your ticket order. We are grateful to the Bloomington Lions Club for supporting AD services for our productions in the Black Box Theater. Large-print artist statements and gallery information is available in the information rack inside the Inez Greenberg Gallery. Alternate formats: With advance notice, all public program information is available in alternative formats such as large-type or Braille. Please contact us at the phone number or email address listed below. For additional information about accessibility, please contact us at 952-563-8575 (voice), info@artistrymn.org, or 952-563-8740 (Bloomington Center for the Arts TTY).